Red water lily, a colour morph of white water lily. Linnaeus is sometimes called the father of systematics. In the discipline systematic biology the order in nature is essential. A classification of plants and animals that mirrors relationship is called a natural system. There are also artificial systems, for example when plants are grouped by colour of flowers. 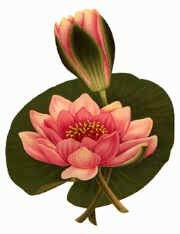 In such a flower colour system closely related tulips would be grouped in different colour groups and a red water lily would be referred to another group than a white water lily of the same species, even though they are only different colour morphs. Linnaeus’ sexual system, based on the number and position of the stamens, was an artificial system. Closely related species could end up in different classes if they had different number of stamens. To be related is to have the same origin. To search for the origin of species we have to know something about their history and the process called evolution. The fossils found tell us something about this, but far from all since they are too few. To find out how species are related to each other we have to study those living now and make some assumptions about how evolution has worked. There are two ways to regard species when searching for relationships. The most common is to assume that the species most alike are most closely related. To measure the likeness one has to examine as many characteristics as possible. In more recent times another method called cladistics has been more widely used. With cladistic methods only similarities with a common origin are regarded. This method can sometimes show that species looking similar are not necessarily most closely related. One example is crocodiles and lizards. They show many similarities, but using cladistic methods we can see that crocodiles are more closely related to birds than to lizards. Comparing species, mostly characteristics seen with the naked eye or a microscope are studied. In recent years also the DNA has been studied which provides more information to reveal relationships.